Nearly forgotten from this period is Images (1972), a small-scale quasi-experimental psychological drama with horror movie trappings, filmed in Ireland. Starring Susannah York (Tom Jones) as a disturbed children's author plagued by hallucinations while staying at a remote vacation home with her husband (René Auberjonois), Images sharply divided critics. Early on it becomes clear that Images is a kind of artsy puzzle film with no definitive answers to its mysteries awaiting the viewer in the final reel. It's been likened to Roman Polanski's similar Repulsion (1965) and Nicholas Roeg's subsequent Don't Look Now (1973). To those I would also add Basil Dearden's The Man Who Haunted Himself (1970), an impressive if depressing film only marginally more conventional than Altman's picture, and like Repulsion the plot and structure has many similarities. Despite an aching self-consciousness, Images has much to recommend it. Susannah York gives an outstanding performance, while Vilmos Zsigmond's cinematography is among the most hauntingly beautiful ever done, aided by the uniquely desolate Irish landscape. Children's author Cathryn (York) is composing a new work when she receives a nighttime telephone call from a friend. Inexplicably, the conversion is interrupted when the voice of a different woman comes onto the line, taunting Cathryn with hints that her husband, Hugh (Auberjonois) is having an affair. When he returns home, she confronts him and, in the middle of an embrace, Hugh unfathomably becomes someone else, and she let loose with a blood-curdling scream at the shock. Hugh, believing a vacation would do the pregnant Cathryn a world of good, drives them to their remote summer house, an isolated cottage near the east coast of Ireland. Looking over the property from a distant hill, Cathryn faintly catches sight of a doppelgänger of herself arriving at the cottage, stepping out of their car, and looking up at her. Inside the house, Cathryn begins hearing voices, of a young girl invoking her name, while, with increasing frequency, Hugh keeps shifting into an apparition of Cathryn's former lover, Frenchman Rene (Marcel Bozzuffi, whom Gene Hackman famously chased through the streets of New York in The French Connection), who died in a plane crash some years before. Further confusing things, a crudely amorous neighbor, Marcel (Hugh Millais), also a onetime lover of Cathryn's, turns up with his adolescent daughter, Susannah (Cathryn Harrison), and Marcel and Hugh begin shape-shifting also. Susannah is likewise linked to Cathryn, and the doppelgänger keeps popping up now and again. In keeping with the story, the characters are named after actors playing their counterparts. There are no special effects. All of the body shifting is done through clever editing and staging. The film's opening scene offers a genuine shock, punctuated by York's primal scream, maybe the most unnerving of any film ever made. Quickly, however, Rene's sudden appearances lose their shock value, especially when Cathryn begins conversing with Rene. For all the ingenuity, Altman cannot sustain the impact of the opening sequence. It's intelligent and adult throughout, but also in its way fruitless and stillborn. Instead, the movie becomes an exercise with the audience trying to make sense of Cathryn's visions. Is she seeing ghosts or merely mad? Images is not a horror film per se, despite its handful of scares and similarities to other vaguely psychological horror films, but rather is more precisely a subjective portrait of extreme mental instability, possibly schizophrenia, though the term never comes up. The picture meanders toward an inconclusive, ambiguous end, the viewer never knowing for certain if the last revelations are real or just more imaginings from Cathryn's addled psychosis. 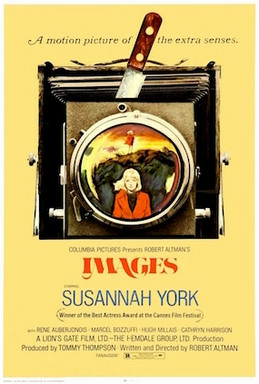 Altman conceived Images back in the ‘60s, and various actresses were attached to the leading role. He chose York partly because he understood he needed an actress the movie audience would stick with for the entirety of the picture, and indeed she keeps us interested where a lesser actress would have made for a grueling viewing experience. The film is frustrating and fascinating at once. The couple's home in the city is extravagantly overdone, a paradise of pretension thankfully done with after the opening scene. Innumerable questions go answered. Is Hugh a professional photographer and Cathryn a professional writer, or are they merely hobbies of independently wealthy marrieds? Hugh is peculiarly self-involved, so oblivious to Cathryn's mental unraveling that the story initially suggests a Gaslight-type story; his eccentricities and apparent ambivalence to her sexual needs lead nowhere. Conversely, Altman and Zsigmond do a marvelous job keeping the viewer off-kilter, directing the viewer not as an impartial third-person witness, but something like an accessory to Cathryn's madness. Zsigmond's camera emphasizes objects like Hugh's camera lenses and a jigsaw puzzle (get it? ), while Altman continually creates a sense of unease in interesting ways. A telephone rings forever but Cathryn ignores it, as if the audience is hearing things; forgetting to open the chimney flue, the house quickly fills with smoke while Cathryn wanders about other rooms in the cottage, unaware of an impending fire. Altman was a great innovator of movie audio mixing and, while Images is an ordinary mono, he nonetheless experiments in little effective ways, like having character voices change from one actor to another mid-sentence. Likewise, the Oscar-nominated musical score is unusual. A collaboration between John Williams and percussivist Stomu Yamashta (a phonetic spelling of Tsutomu Yamashita), it's dominated by Japanese instruments unfamiliar to western ears but common in Japanese kaidan eiga (ghost story movies). Filmed in Panavision, Arrow's Blu-ray of Images looks stunning, expertly presenting Vilmos Zsigmond's cinematography in all its rain-soaked glory, a perfect blend of film-like grain and saturated color that exquisitely underscores the isolation of the story's characters and the Cathyn's mental state. The master was sourced from the original camera in 4K while the LPCM mono audio was sourced from the original 35mm magnetic. English subtitles are offered on this Region "A" disc. A mix of old and new supplements compliments the disc. These include a new commentary track by Samm Deighan and Kat Ellinger; a scene-specific commentary by director Altman; an older featurette, "Imagining Images," with Altman; a brief interview with Cathryn Harrison and a longish "Appreciation" by Stephen Thrower. A full-color booklet and trailer round out the extras. Challenging, not entirely successful but extremely well done on many levels, Images is Highly Recommended.